I’ve been busier this week, so there aren’t as many pictures this time. Apologies! a friend. 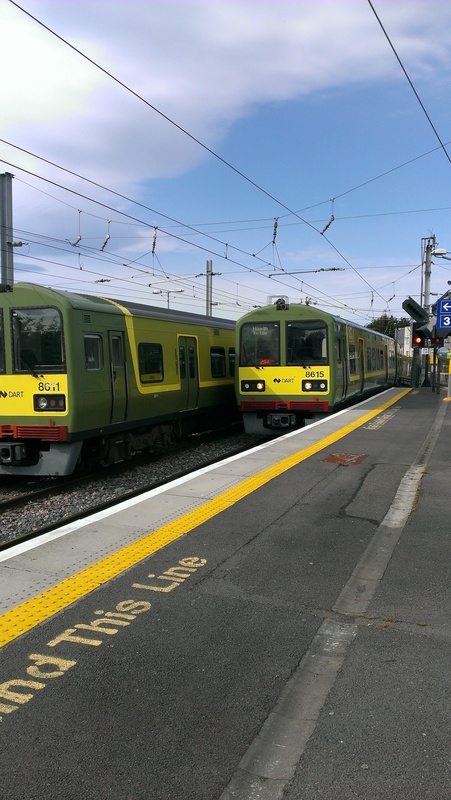 We took the bus to Blackrock, where we caught the DART (the Dublin version of BART) to Howth. The town was cute and smelled like seafood and fish. Mmm fish. We stopped by the famous Howth Market but it wasn’t completely set up yet so we walked around to the edge of the dock and at the lighthouse. For lunch, I got mussels and mashed potatoes. The mussels were delicious. Visited the market afterwards and got a kiwi cake that was okay but didn’t taste too much like kiwi. My friend and I then parted ways so she could go on her cliff walk and I could take the train back to City Centre. Why City Centre? To watch the musical Once! So excited. I walked to Olympia Theatre to get to get my tickets from the box office. Before the musical, audience members were allowed to hang out onstage, where we could buy beer from the onstage bar. We were ushered offstage when the musician/actors came onstage and started playing songs. One of these musicians turned out to be the main actor, Tom Parsons. The musical was such a treat. Highly recommended. 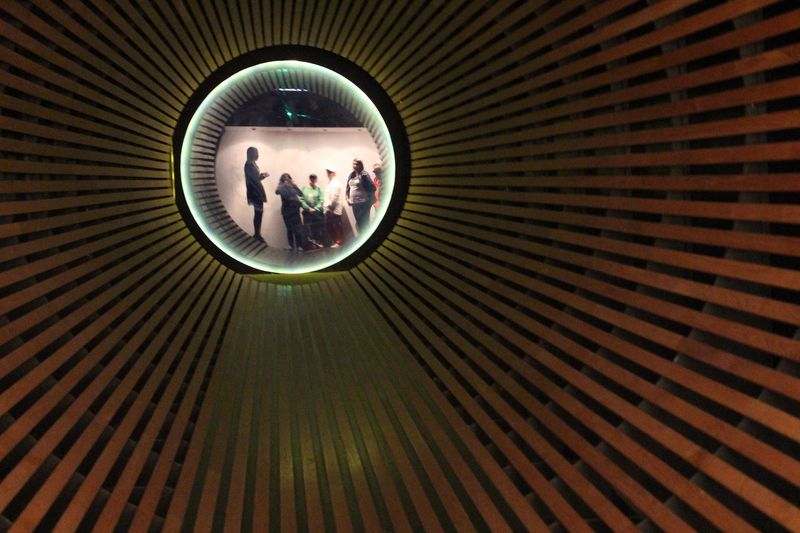 Giant’s tunnel in Leprechaun Museum! While I was waiting at the bus stop this morning, two guys walked by with a bunch of brown lunch bags and said they were handing out free lunches. It was shady, but I ate the sandwiches for lunch later and everything seemed okay. I took the bus to the National Leprechaun Museum, which I booked a ticket for last night. I wasn’t sure what to expect from the tour, but it ended up being a fantastic walk through a bunch of rooms with props that included giant’s furniture (to show what it feels like to be a leprechaun), a rainbow (bunch of cords hanging from the ceiling) and a wooden forest. A lady guided us through the rooms and told us stories about leprechauns and fairies. I expected more stories, but it was still a fun experience. After all, I got to take a selfie with a 6-foot leprechaun. Afterwards I took a bus to Merrion Square to check out a street performance festival going on. It turned out to be mostly little kids running around the park, so I just ate one of my free sandwiches on a bench and took off. Got on the bus to Dun Laoghaire. My Howth companion from yesterday got on the bus a stop after me. were booths everywhere in the park selling food of all kinds. My friend and I decided to wander around separately, so I sat down next to this couple who were accompanied by two adorable Cavalier King Charles spaniels with the sweetest eyes. The guy was surprised that “I speak English,” and I told him I was American. After walking around some more, I bought some orange chocolate fudge from a market booth and 99 ice cream from Teddy’s Ice Cream. 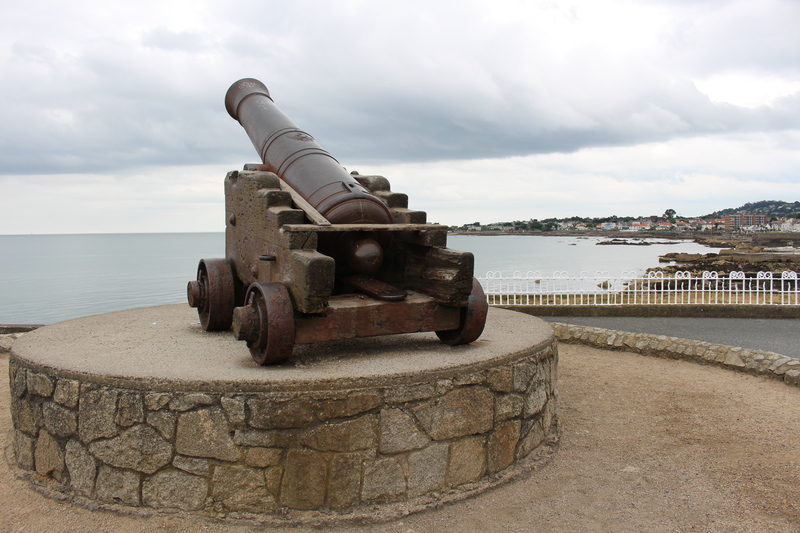 I ate my ice cream near the coast line and enjoyed the sights of Dun Laoghaire. People everywhere were walking their dogs, which is paradise for me. There was a brass band playing music on a gazebo to raise money for the Irish Guide Dog program. Some of the future guide dogs were being quite naughty and frisky. At the end of the famous pier, there was a lighthouse that served as a kind of fort. I walked there and back to town center, but decided to go back home when it started raining hard. I’ve been staring at a screen all day and my head is woozy. My co-intern wasn’t here today so I just grabbed something quick from the convenience store for lunch. Afterwards, I watched one of the sports editors play a few holes with a fancy golf simulator in the TV studio while my editor filmed it. This morning was more sitting in front of my computer. Around noon, we accompanied a videographer to interview a man who still cycles after losing his arm in a cycling accident. We had O’Shea’s for lunch again and I ordered my usual soup and mushy peas. I’ve been so boring lately. There was a new political party called the “Social Democrats” being founded today at a press conference in the Dublin City Council, so we accompanied a videographer there. I finally got the salmon dish at O’Shea’s, and it was all I dreamed of and more. Afterwards we hit the streets to film some interviews with Dublin street musicians. On Grafton street, we got an interview from an Australian musician named Sam Brittain. We also got interviews with a group of dubliners and a Brazilian girl playing guitar. I barely had time to edit the clips at the office before my shift ended. Back at home, I started watching the series Sense8, which is actually really, really good. Had roast turkey for lunch and mango passion fruit cheesecake for dessert. I ate the cake at my desk as I worked on editing construction noises out of the background of my interview. After work I wanted to watch Inside Out at a family film festival near Temple Bar, but when I got there the tickets were all bought up by kids and families. So I went home. Today was laundry day, and I worked out in the gym next to the laundry room while waiting for my clothes to come out of the wash.
We talked about Dubliners in class today, which I remember from AP English. Spent the rest of the afternoon doing homework. Our class excursion that evening was the play The Shadow of a Gunman at the Abbey Theatre. It was so-so, not enough action for my taste. Had dinner at a club afterwards with my friends. Whew, it’s been a long week.